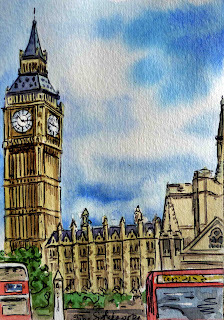 The last but not least sketch for my Sketchbook Project for NY Library - the Great City of London. London has been called "The World in One City". This tells a lot! With its diverse range of people, cultures, religious with its many attractions for the tourists from over the World London breathes the history and it's calling for a visit. In my mind I am already there walking down to Hyde Park, visiting British Museum and National Gallery, peaking at Buckingham Palace, and crossing the Millennium Bridge. 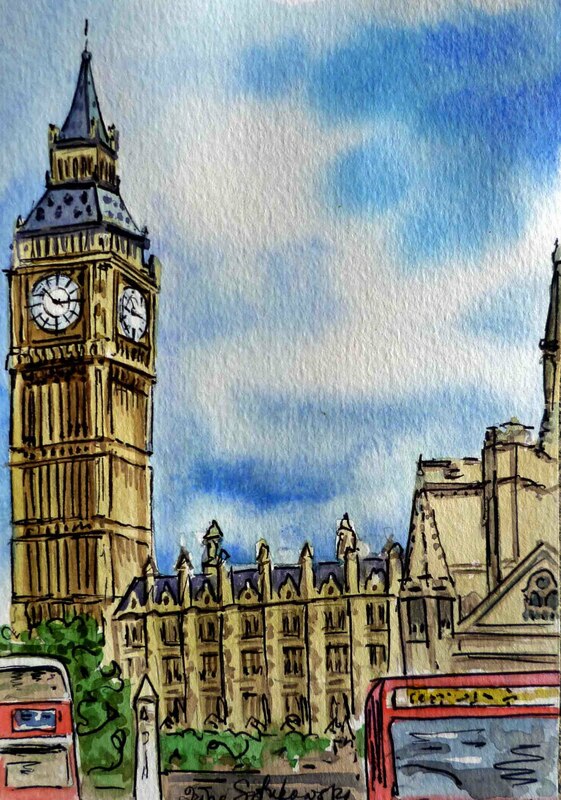 And sure enough, the most recognizable London's view, 150+ year-old Big Ben (on my sketch) will not be able to escape my attention when I visit this beautiful City. 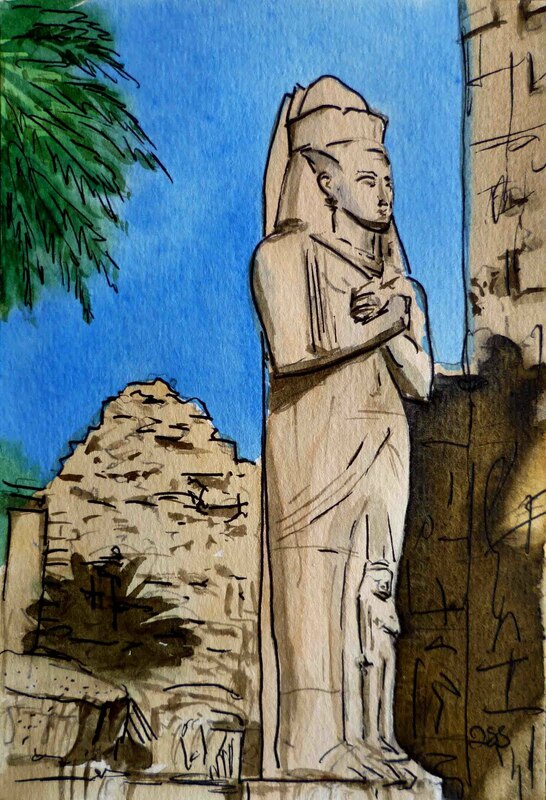 Here is my next to last sketch for the Sketchbook Project of NY Library. 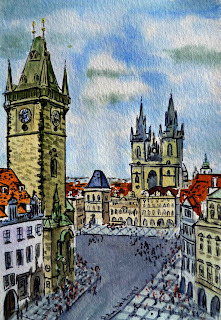 On this sketch you see the Old Town Square in Prague, Capital of Czech Republic. 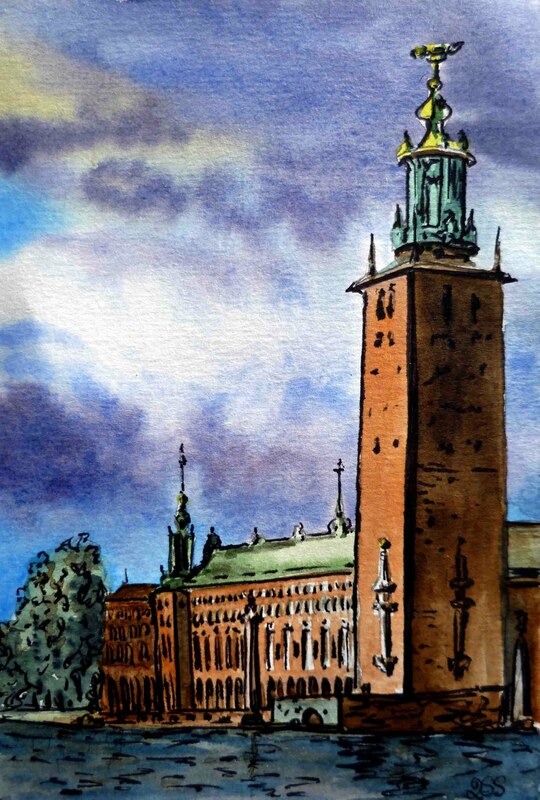 What I liked painting here is the big clock tower with it miscellaneous-brick walls. I just can imagine how each stone is breathing the history here at the Old Town Square. The photo reference contained a lot of modern things such booths, markets, bright advertisements on this square; but I eliminated them wanting to see this historical place as it would be seen centuries ago. I did leave people though in order to give more life to this stone-man-made beauty. When I am going to Holland I will definitely start with its Capital Amsterdam. Being built in early 13th century by 17th century this city became a center of world economy. The rise of merchandise, political stability, and economical success gave opportunity to a lot of artist to thrive and polish their skills. The Dutch paintings, specifically Dutch Still Life, a my favorite of that time of the world history of art. I am hoping to visit as many museums as I can to see the original still lives by many favorite artists (just name a few: Jan Brueghel the Elder , Osias Beert,Osias Beert, Clara Peeters, Jan Davidsz de Heem). 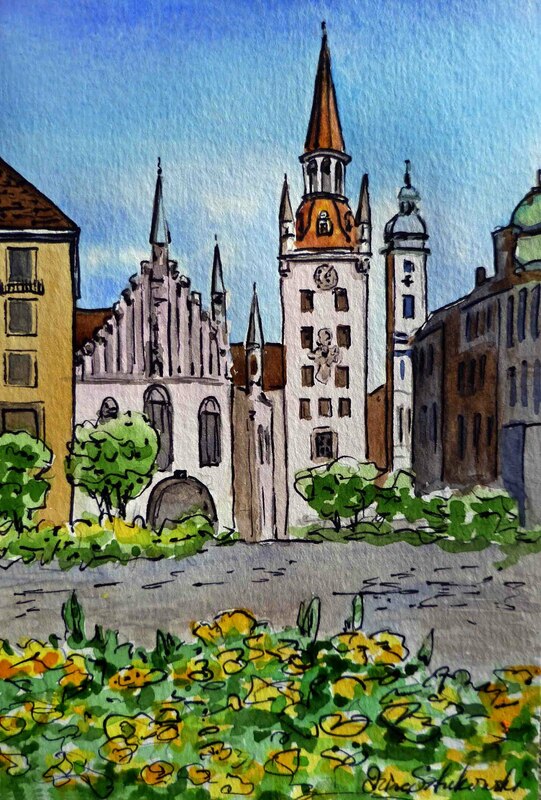 This sketch is about Marienplatz Old Town Hall, which is located in Munich, Germany. First built in wood it was completely destroyed by fire in 1460. 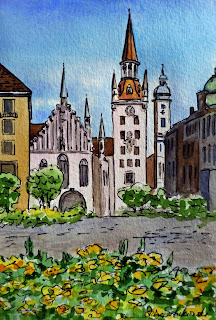 Between 1470 and 1480, the old town hall was rebuilt in Gothic style by Jörg von Halsbach. 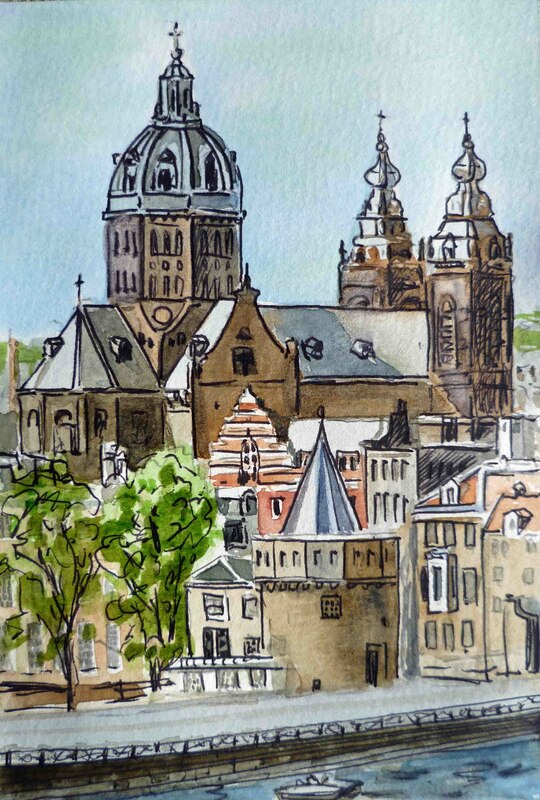 I thing the Gothic pointing roofs and lace knitted architecture that what invites me in visiting Europe and particularly Germany. It is amazing how in spite the hardest time for Europe in 1940s its countries were re-born practically from ashes. 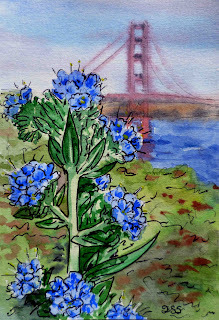 In this scene the beauty of the yellow flowers compete with the beauty of another kind, the man-made one. When I am in Poland, I really would love to visit Warsaw, the city which history goes as far back as the 12th and 13th century. 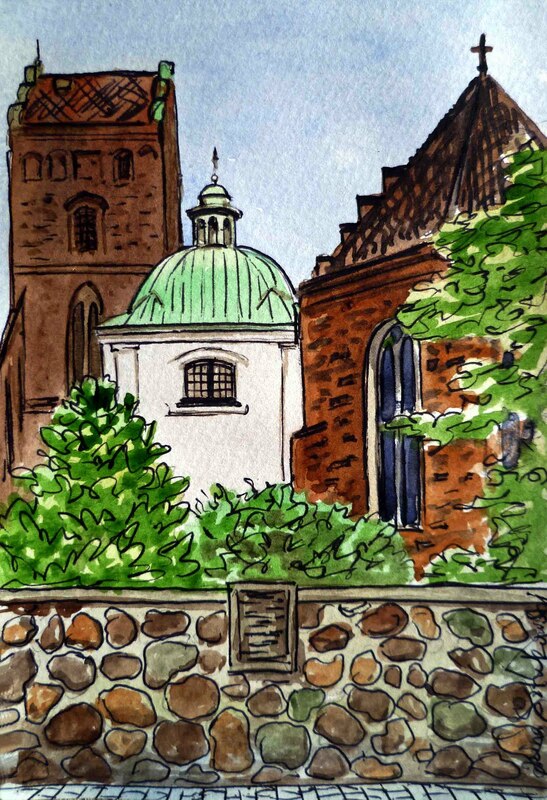 And when I am there it would be great to go St. Mary’s Old Church (in Polish: Kosciól Nawiedzenia Najswietszej Marii Panny). It is one of oldest buildings and one of the few surviving examples of Gothic architecture in the city, which was built in 1411. And in spite of the fact it was destroyed almost completely during World War II, it was reconstructed and brings joy to people in our days. I’ve read about this church that it became a symbol of the capital’s rebirth of post-war re-creation of the Old Town Warsaw, which was practically risen from ashes after a devastation of the war. 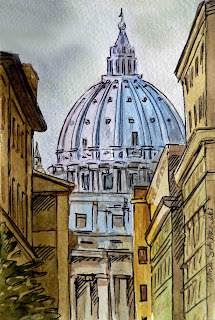 During my visit to Italy I cannot miss the State of Vatican City, the smallest independent state in the world, which has a whole complex of different museums. My main goal is to observe the old frescoes in Michelangelo’s Sistine Chapel and Raphael's Rooms. I just want to see with my own eyes these 16th century masterpieces. Italia! Italia! I always wanted to go there. And my desire doubled if not tripled when last Summer I started learning about Medieval and Renaissance art in my Art History class. 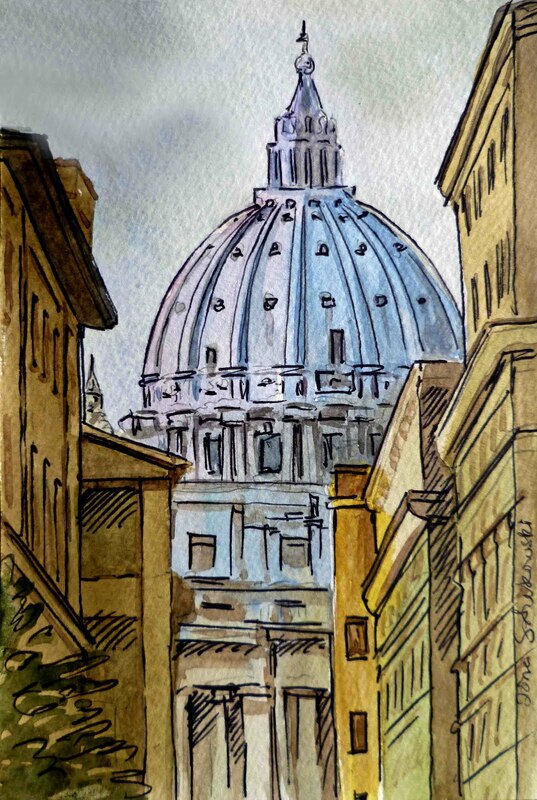 Italy became the center of art and culture many centuries ago. Artists from different countries went to learn art in Italy from old masters. 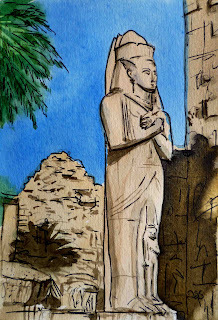 Throughout the times the history was well preserved there. 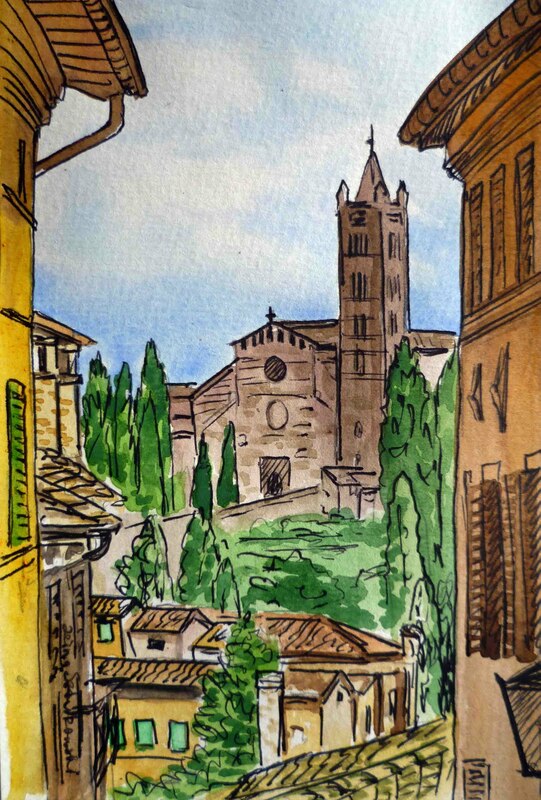 And I believe that unlike some of other European cities Italian ones keep their charm and remain untouched by civilization with its concrete-glass-high scrapers; or, at least I want to believe. I've also heard that Italian people are very nice. My friend lived in Italy for several years and when she came to Russia she said that the character of Russian people, their charisma reminded her Italian character a lot. I traveled to Stockholm by Silja Line cruise from Helsinki. Only one night on the ship and you are in the most beautiful city of Sweden. 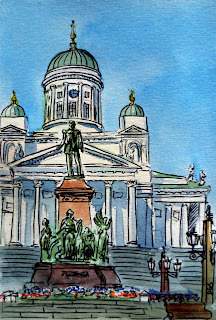 Besides old downtown with its narrow streets and gorgeous King’s Palace; there are plenty of things to do for a historian as well as for a modern tourist who likes to shop in the old part of the town. Although, I was not denying shopping, one a very quiet and isolated area remained my favorite part of Stockholm. It is a well preserved historical place Skansen which is located on the small island of Djurgården not far away from the downtown. When you are there you practically fly in times and experience the old days Sweden with the countryside, old town quarter, small parks and gardens. You can feel, be, see the old village with its routines and tribal rules. And if you are lucky you can even witness how is the glassblower is making old style vases in the glass shop. 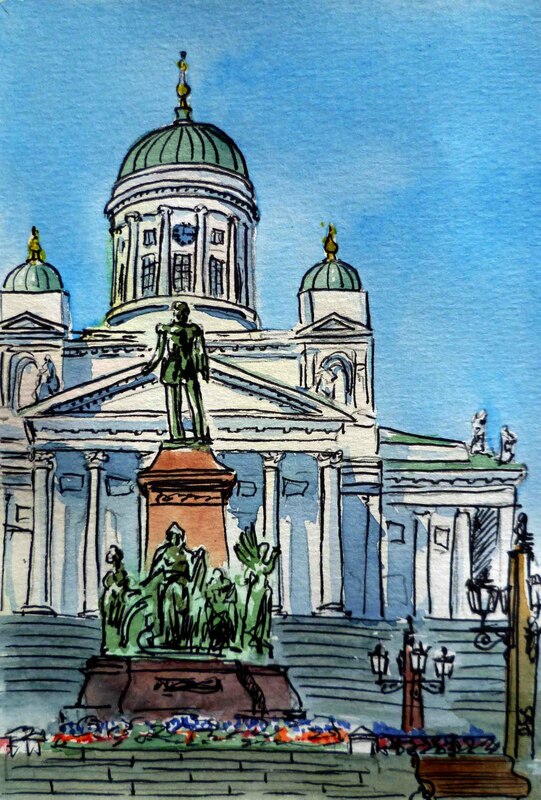 The sketch that you see is of my other favorite place where I happened to bring the group of tourists that I used to bring from Saint Petersburg. 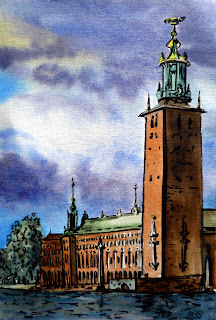 It is Stockholm City Hall (Stadshus) ; for some reason its tall part always reminded me Venice Bell Tower although I have not been to Italy yet. Spain is the country that woke up my love to the color. Being born in the North of Russia, in the city that has half year winter, and another half cloudy skies and gray weather; and when the Sun is literally shining only around 30 days in whole year (except the cold winter days with below 30 Celsius when you don’t want to show up your nose out of the door); in Spain I was welcomed by a warm sea, sunny days, friendly people, hot music, and absolutely stunning architecture. I thought nothing can impress me after leaving in the great City of Saint Petersburg. 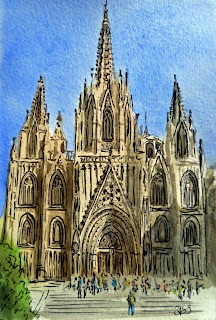 When I visited Barcelona and saw future Gaudi’s inspiration Cathedral of the Holy Cross and Saint Eulalia, it reminded me a sand castle made by a genius Giant. Looking fragile but meantime timelessly strong and eternal the Cathedral of Barcelona captivated my attention for a long time. I found myself in between time zones when I stopped keeping track on what was happening around and remained looking at the piece of art, centimeter by centimeter, exploring its beauty. As the second piece for my Sketchbook Project I chose a very recognizable subject matter. It is hard to believe that so many people (painters, poets, architects) thought in 1900s that this was a soar on the surface of Paris. 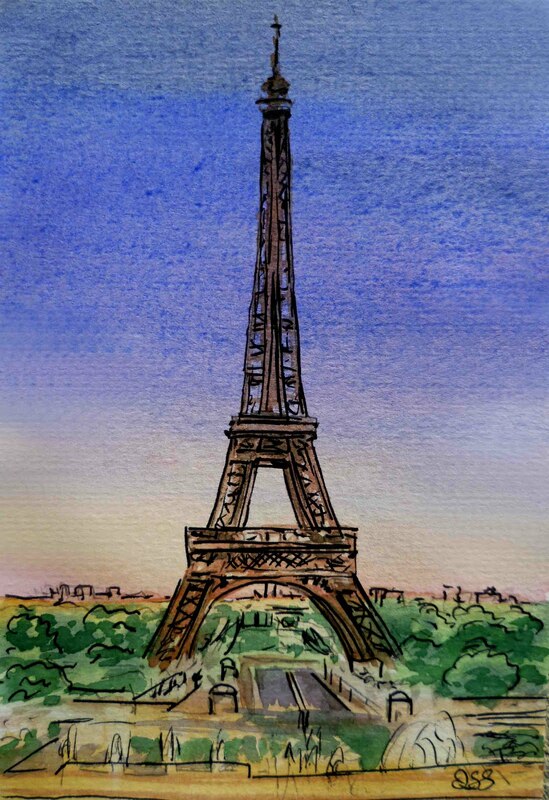 I previously posted a few interesting facts about Eiffel Tower here. 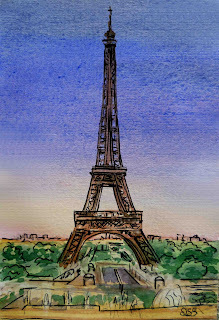 I've been to Paris twice with 12 years break in between. But each time I went there I still found something amazing for myself. Besides its obviously touristic atmosphere it somehow makes you feel wanting to visit it again and again. And I will certainly make sure I take tons of pictures when I come back to Paris one more time. The Eiffel Tower is fun; but my favorite places in Paris still are Musée d'Orsay and Musée Rodin with its gorgeous garden. 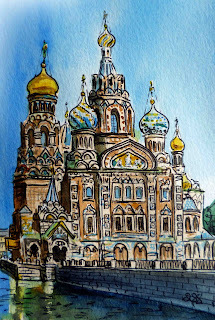 This year I am participating in The Sketchbook Project 2012 World Tour and I chose the theme Travel With Me. 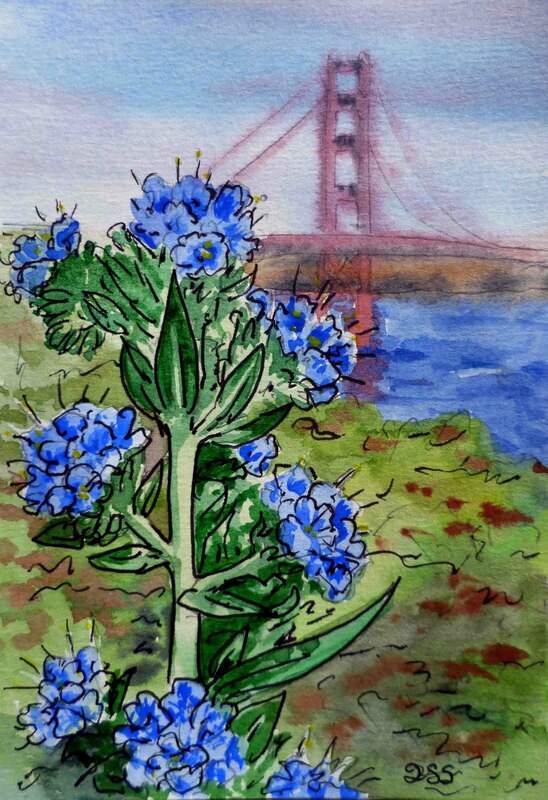 The book has only 14 pages and it will have 14 of my original watercolor sketches. I decided to place seven countries that I've visited or lived in; and, other seven will be the countries and places that I dream to visit. , an amazing piece of architecture that was built in early 1900s. I lived 10 minutes walk from this church but was able to visit it only in the late 90s as it was closed for restoration for more than 30 years. The building is decorated with tiny pieces of mosaics, gold, blue, terracotta. Each inch is worth looking at and admire. This is the first sketch for my book. Thirteen more to come.